BARCELONA—Almost a dozen years after the debut of the iPhone, all smartphones look pretty much alike from more than a few feet away. These days, mobile vendors need to do a little something extra to make their own rectangle of glass, plastic and metal stand out. And some of them do a lot more, as I saw while checking out a few square miles worth of gadget exhibits at the MWC Barcelona trade show here. Avenir Telecom’s P18K Pop quickly became better known as the Energizer battery phone. This French firm’s Energizer-branded Android handset is built around a mammoth 18,000-milliamp-hour battery. That’s about six times the capacity of the batteries in most smartphones and, the company says, will permit two straight days of video streaming. (I’m afraid to think about what that much sustained exposure to YouTube would do the human psyche.) At about an inch thick, this €599 device somehow doesn’t have room for a headphone jack. The $699 Nokia 9 PureView may have taken its inspiration from an insect’s compound eyes—it features a five, yes five, 12-megapixel cameras on its back. That may allow manufacturer HMD Global to dunk on vendors that sell phones with a mere two or three cameras, but by combining the slightly different perspectives of each lens, the PureView’s software also lets you refocus a picture after you take it. Open a photo, tap the edit button, tap on a part of the image you want to emphasize, and that will snap into focus while the rest blurs. That’s neat, although maybe not neat enough for me to forgive this phone for excluding a headphone jack. 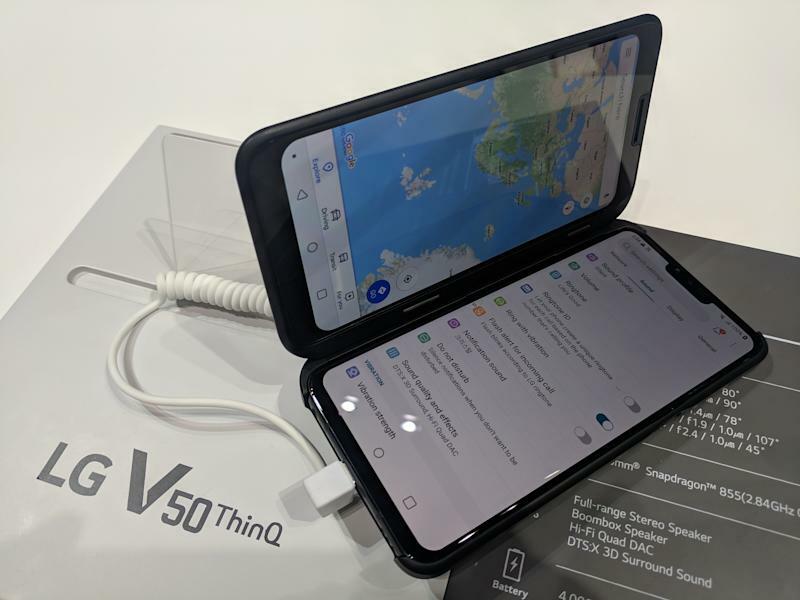 LG found a novel way to tap into the newfound interest in foldable phones: an optional second screen you can attach to its upcoming V50 ThinQ 5G smartphone. This Dual Screen add-on attaches like a regular case but also draws power and a video signal from three connectors on the side of the V50. Tap a small onscreen button to turn on that extra 6.2-inch display and start using it to view an extra app or as a touchscreen controller for a game. If you do, though, you may want to have a charger handy. I imagine running a second display will do a number on the V50’s battery. The 6.5-inch display on Sony’s Xperia 1 offers a resolution of 1,644 x 3,840 pixels, matching the horizontal resolution of a 4K screen. That’s unparalleled in a phone. It’s also pretty much useless, since human retinas have no hope of making out all that extra resolution from any normal viewing distance. The Xperia 1’s HDR color—brighter and deeper than on average phones—makes for a better selling point, but that may not be enough to overcome a price that, while unannounced, seems likely to be on the high side. And have I mentioned that I don’t like phones without headphone jacks? 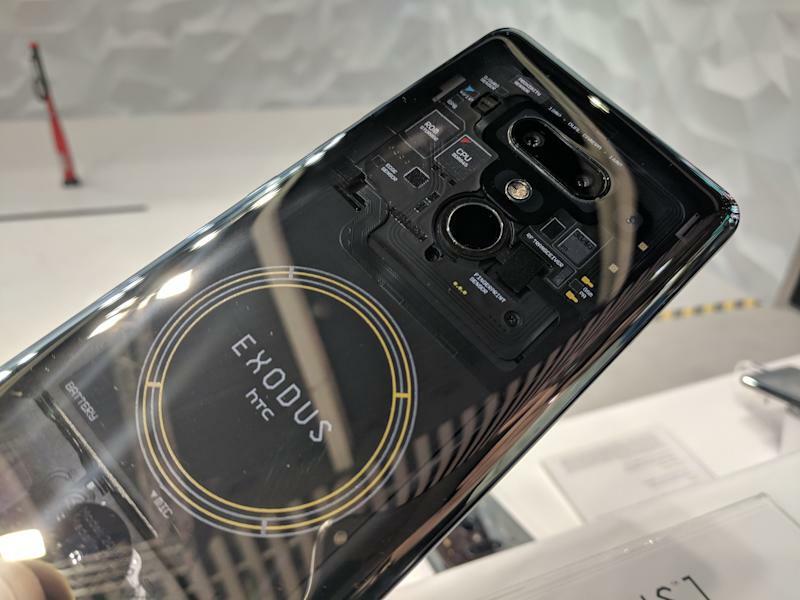 I suppose I shouldn’t have been surprised to see so many blockchain-centric phones, but HTC’s Exodus 1 stood out for having the backing of a name-brand phone vendor. This €624 Android phone features a Zion crytocurrency wallet stored in a secure enclave—a computer-within-a-computer, segregated from the core Android system to protect your digital currency. I don’t know about the mass-market appeal of that, but at least you get a stylish phone in the bargain: The Exodus features a transparent back, letting you gawk at its guts.